This chapter describes the experimental equipment, program, and findings for several abutment riprap layouts installed according to HEC-23 as well as common practice of riprap installations in the field. (3) A second set of experimental results is described, where the performance of a proposed buried riprap installation focused on potential edge failure of the riprap and impact on the predicted contraction scour equation under clear-water conditions. Edge failure is defined as scour (movement) of the riprap stones at the edges of a riprap apron. (16) The experiments were conducted at the J.Sterling Jones Hydraulics Research Laboratory located in McLean, VA. 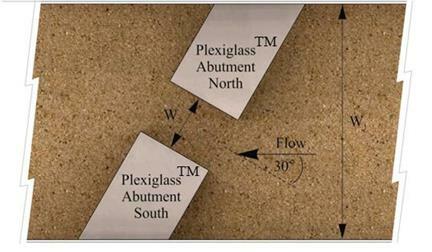 The physical experiments were conducted using a tilting flume with a model test section, as described in the following sections. A 6-ft (1.8-m)-wide, 1.8-ft (0.55 m)-deep, and 70-ft (21.3-m)-long tilting flume with transparent glass side walls and water recirculation was used to conduct the experiments. An illustration of the flume is presented in figure 56. Figure 56. Illustration. FHWA tilting flume. The structure’s skeleton was composed of U-shaped lateral steel frames supported on box-sectioned longitudinal girders. A walkway was provided on one side of the structure. Water was supplied to the flume by a circulation system with a ground sump of 7,400 ft3 (210 m3) and a pump with a maximum capacity of 10.6 ft3/s (0.30 m3/s). The discharge was measured by an electromagnetic flowmeter installed before the flow was introduced to an upstream head box equipped with a screen and filter. Rapid development of the fully turbulent boundary layer was achieved through an upstream ramp followed by a honeycomb mesh as a flow straightener and an upstream transition zone composed of a layer of coarse sediments carefully placed on the flume bed to provide excess friction. The flow depth was regulated through a computer-operated downstream adjustable tail gate. A 0.5-ft (0.15-m)-thick layer of uniform bed material (D50 = 0.039 inches (1 mm)) was evenly spread along the full length of the test section that was 17.4 ft (5.3 m) long by 6 ft (1.8 m) wide and started after the transition zone. The surface of the sand bed was level with the fixed flume floor prior to any scouring. A sediment bed recess where the vertical-wall abutment models were installed was sufficiently deep to model local scour to a depth of 1.3 ft (0.40 m). Figure 57 shows the test section looking in the upstream direction. As was common practice for clear-water scour experiments, there was no compaction of the bed material after leveling the sand bed in the test section. The requirement for clear-water scour was that bed transport or scour was not evident in the upstream approach section. Figure 57. Photo. Vertical-wall abutment models installed in the test section. In addition to a manually moving carriage, the flume was instrumented with an automated three‑axis positioning system shown in figure 58, with traversing capability for the entire length, width, and height of the flume at a resolution of 0.039 inches (1 mm). This carriage could position probes at any location within the test section to make point measurements for flow velocities using an acoustic Doppler velocimeter (ADV) and measurements of bed surface bathymetry using a laser distance sensor. Figure 58. Photos. Automated flume carriage (left) and ADV probe (right). The laboratory experiments were designed to study the effect of several riprap installations on the contraction scour depth for a small-scale model of a single-span bridge opening. Figure 59 shows a cross-section view of the layout with principal dimensions and relevant hydraulic parameters. Two vertical-wall model abutments built on shallow foundations with the same length were placed in the sediment bed recess. The approach channel width (W1) was 6 ft (1.8m), and the contracted (bridge opening) width (W2) was allowed to vary. The varied contracted width permitted investigation of alternative contraction ratios (W2/W1). The abutment width (parallel to the flow direction) of 2.0 ft (0.61 m) was scaled down to represent a road width for two lanes plus shoulders, based on U.S. standards. Froude similarity was applied to set the approach flow (depth and velocity) conditions. All of the physical experiments were performed with a uniform sediment bed (D50=0.039 inches (1 mm)) under clear-water scour conditions. Figure 59. Sketch. Cross-section view of bridge opening for physical experiments. Based on the design procedure in HEC-23, the base of the abutment (top of foundation) was set at or below the estimated contraction scour plus the LTD.(3) For these experiments, LTD was not considered. For this investigation, Laursen’s clear-water contraction scour equation from HEC-18 was used to estimate the predicted contraction scour. (2) Using the contraction ratio (W2/W1) and the approach flow conditions, the clear-water contraction scour was computed, and the top of the shallow foundations were placed at the limit of estimated contraction scour, as shown in figure 59. Several riprap installations for abutment scour from HEC-23 DGs 14 and 18 as well as variations observed in the field were tested. (3) Tests with riprap covering the entire bed were also conducted to explore improved installation practices. In all cases, the test riprap layout was placed on a geotextile filter. The median diameter of the riprap rock was sized for the flow conditions in the bridge opening using the recommendations in HEC-23. All riprap tests had a running time of 24h to achieve equilibrium conditions during the test. Using the laser distance sensor, a digital bed bathymetry map was obtained to measure the scour depth with the riprap (ycR). These scour depths were compared with the computed contraction scour depths for a condition without riprap. To ensure that the riprap size determined from the HEC-23 guidance (DGs14 and 18) would not be susceptible to shear failure, a preliminary series of experiments on a fixed bed were conducted. (3) These experiments confirmed that the riprap size chosen would not fail by shear alone. This would simplify interpretation of failure mechanisms for the experiments with an erodible bed. Overall, 11 erodible bed experiments were run and are summarized in table 1. Runs 1–5 represented riprap layouts that corresponded to HEC-23 guidelines or variations that had been observed in the field. (3) Runs 6, 8, 9, and 11 were variations of a full-width installation where riprap was extended across the entire contracted channel. Runs 7 and 10 did not have riprap and were provided for comparison. Detailed equilibrium scour maps for all runs are provided in appendixB. Table 1 summarizes the riprap size used, the contraction ratio, and the approach flow characteristics. The flow depth in the contracted section before erosion (y0) is also provided. Finally, the table summarizes the estimated contraction scour depth from the HEC-18 equation (yc) and the measured maximum contraction scour depth with the riprap (ycR). (2) The model scale for length and velocity for the physical experiments was based on a prototype-to-model ratio of10. The contraction ratios, W2/W1, chosen for the experiments were intended to represent a range within the bounds of a very severe contraction (small contraction ratio) and no contraction (contraction ratio equal to 1). The selected contraction ratios were intended to be conservative for what was likely to occur in the field, which were dependent on stream width. Table 1. Abutment riprap experimental results. *Measured depths represent total (abutment and contraction) scour. 1 ft/s = 0.305 m/s. 1 ft = 0.305 m.
The runs for riprap aprons based on HEC-23 guidelines and related field installations (runs 1–5) were all conducted with the same riprap size (except for run 1), contraction ratio, and approach flow conditions. (3) The only change was the riprap layout. For these runs, the HEC-18 estimated contraction scour depth was 0.20 ft (0.061 m). (2) The measured maximum contraction scour depth for these runs ranged from 0.46 to 0.56ft (0.14 to 0.17 m). However, for these five runs, the estimated contraction scour should not be directly compared with the measured maximum scour because these conditions without riprap were not tested as a reference point. Figure 60 illustrates the riprap apron layout according to HEC-23 DG 14 for bridge abutments (run 1). (3) The bottom of the apron is located on top of the foundation at an elevation corresponding to the estimated contraction scour depth. It extends out from the abutment a distance of twice the pre-scour flow depth in the contracted section. Photographs of run 1 before and after scour are shown in figure 61. Because the geometric form of the GRS and PlexiglassTM abutments were identical, there was no difference in test results between the two sides. The GRS side was used to provide a more realistic representation of the field installation, while the PlexiglassTM side was used for observational instrumentation. Figure 60. Sketch. Run 1 cross section–HEC-23 DG 14. Figure 61. Photos. Comparison of run 1 as-built riprap installation (left) and at equilibrium scour (right). Initial edge failure of the rock occurred near the abutment width centerline. The deepest scour was measured downstream of the abutment width centerline. This result suggested that the apron extent of twice the pre-scour flow depth was sufficient to protect the erodible bed from local vortices and large turbulent structures that developed at the upstream abutment corners, confirming the efficacy of the design guideline for abutment (local) scour. At the same time, the large apron (compared with the opening width) appeared to change the discharge distribution in the contracted section, leading to higher bed shear stresses and, potentially, deeper contraction scour than would have occurred for an unprotected channel bed. Figure 62 illustrates the riprap apron layout according to HEC-23 DG 18 for bottomless culverts (run 2). (2) The bottom of the apron is located on top of the foundation at an elevation corresponding to the estimated contraction scour depth and reaches below the estimated contraction scour depth beyond the foundation. It extends out from the abutment and slopes down to a toe at a 1:3 vertical-to-horizontal (V:H) slope. Figure 63 compares the run 2 before and after scour. Figure 62. Sketch. Run 2 cross section–HEC-23 DG 18. Figure 63. Photos. Comparison of run 2 as-built riprap installation (left) and at equilibrium scour (right). This apron configuration for run 2 was more difficult to prepare than for run 1 because it was difficult to compact the bed material that covered the toe of the riprap. (Geotechnical engineers at the Turner Fairbank Highway Research Center (TFHRC) have noted problems with compaction of the bed materials on top of the sloped riprap for field applications.) In addition, the riprap volume required was almost twice the amount as that for DG 14 layout. Initially, bed material on top of the riprap was easily eroded owing to the horseshoe vortex at the upstream edge of the abutments. Subsequently, an edge failure similar to that observed for run 1 was also observed for run 2. Figure 64 illustrates a sloped riprap apron layout loosely based on HEC-23 DG 18 for bottomless culverts (run 3). (2) In this installation, the effect on the streambed was reduced by decreasing the apron extent. This was compensated for by piling the riprap higher so that when scour occurred, the reserves of rock could tumble into the scour hole thereby armoring the hole. Photographs of run 3 before and after scour are shown in figure 65. Figure 64. Sketch. Run 3 cross section sloped field installation. Figure 65. Photos. Comparison of run 3 as-built riprap installation (left) and at equilibrium scour (right). In run 3, the scour hole at the upstream edge of the riprap developed quickly and before any erosion across the bridge opening was visible. The edge failure was followed by a translational slide (or modified slump) of the riprap once the geotextile filter at the bottom was undermined. The downslope movement of rock resulted from a loss of foundation support at the toe induced by the edge failure. As is seen in the figure, large amounts of riprap material fell into the scour hole. Figure 66 illustrates a sloped riprap apron (run 4) that expanded on the configuration in run 3 by extending the riprap apron to a distance equal to the pre-scour water depth. As with run 3, a reserve of riprap was piled above the bed elevation so that when scour occurred, the reserves of rock could tumble into the scour hole thereby armoring the hole. Photographs of the run 4 before and after scour are shown in figure 67. Figure 66. Sketch. Run 4 cross section sloped. Figure 67. Photo. Comparison of run 4 as-built riprap installation (left) and at equilibrium scour (right). For run 4, scour started at the upstream edge of the riprap with substantial erosion across the bridge opening. An edge failure was followed by a translational slide (or modified slump) of the riprap once the geotextile filter at the bottom was undermined. The downslope movement of rock resulted from a loss of foundation support at the toe induced by edge failure. The effect of side slope geometry appeared to increase the erosion intensity on the bed material. After equilibrium was reached, the remaining horizontal apron width was measured along the periphery of the abutment. The average remaining width at the front face was 60 percent of the installed apron width (i.e., about 40 percent of the original apron was undermined). Figure 68 illustrates a level riprap apron that follows HEC-23 DG 14 except that the apron width extends only to a distance equal to the pre-scour water depth rather than twice the pre-scour water depth (run 5). (3) Photographs of the run 5 before and after scour are shown in figure 69. Figure 68. Sketch. Run 5 cross section flush. Figure 69. Photo. Comparison of run 5 as-built riprap installation (left) and at equilibrium scour (right). In run 5, the scour hole at the upstream edge of the riprap developed quickly before contraction scour began. An edge failure then occurred, resulting in riprap falling into the scour hole. The remaining apron was measured along the periphery of the abutment. The remaining apron width at the front face was 70 percent of the original width, that is, 30 percent of the original apron was undermined. All five of the initial set of runs resulted in edge failures with loss of riprap into the contraction scour hole. Runs 1 and 5 were based on HEC-23 DG14 and differed only in apron extent. (3) Even with the differing extents, the measured maximum scour for these two runs was the same at 0.46 ft (0.14m). This was less than the measured scour depth for the three sloped riprap installations (runs 2–4). Because these riprap aprons are considered a structural component of shallow foundation designs, they must maintain their integrity throughout the design life of the bridge. Therefore, while edge failure in a 24-h steady-state hydrologic event might not result in abutment failure in the laboratory, edge failure may result in more threatening consequences in the field because of the hydrologic, geomorphic, debris, and sediment transport variability experienced. A proposed variation on HEC-23 DG14 for narrow openings was evaluated in a second set of runs. (3) The major differences between the original HEC-23 DG 14 and the proposed variation were that the apron extent fully spanned the contracted section and was buried to potentially address environmental and aesthetic concerns. However, installation would require initial disturbance of the entire channel cross section at the bridge. Runs 8, 9, and 11 were all conducted with the same riprap size, contraction ratio, and approach flow conditions; however, these conditions were not the same as those for the first set of runs (1–5). Riprap rock size for runs 8, 9, and 11 was computed using HEC-23 DG 14. In each case, the apron was extended upstream and downstream of the abutment a distance equal to 1.5 times the pre-scour flow depth in the contracted section. For these runs, the HEC-18 estimated contraction scour depth was 0.36ft (0.11 m). (2) The measured maximum contraction scour depth for these runs was also 0.36 ft (0.11m), because once the scour depth reached this elevation, further scour was prevented by the riprap apron. Run 6 was conducted with the same set of hydraulic conditions as runs 1–5. Runs 7 and 10 did not include riprap and provide a reference for comparing measured scour depths. Figure 70 illustrates a full-width buried apron (run 6). The top of the apron is located flush with the top of the foundation at an elevation corresponding to the estimated contraction scour depth. It extends the full width of the contracted opening. The apron extends upstream of the abutment a distance of 1.5y0. It was speculated that for flows lower than the scouring flows, sediment might replenish the bed. Photographs of run 6 before and after scour are shown in figure 71. Figure 70. Sketch. Run 6 cross section buried full-width level. Figure 71. Photos. Comparison of run 6 as-built riprap installation (left) and at equilibrium scour (right). As shown in figure 71, there was no edge failure at the upstream or downstream edges; the apron remained intact. Local scour naturally formed at the abutment toe upstream corner. This erosion process occurred rapidly until the riprap apron surface became exposed. The scour hole expanded toward the centerline of the bridge opening. Figure 72 also illustrates a full-width buried apron (run 8) as was shown for run 6. In run 8, the contraction was more severe, and the approach flow conditions were changed from run 6. Photographs of run 8 before and after scour are shown in figure 73. Figure 72. Sketch. Run 8 cross section buried full-width level. Figure 73. Photos. 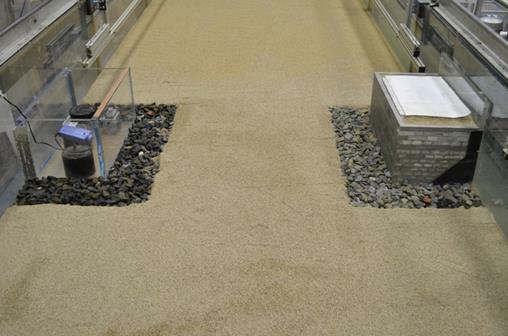 Comparison of run 8 as-built riprap installation (left) and at equilibrium scour (right). In run 8, local scour formed at the abutment toe upstream corner. This erosion process occurred rapidly until the riprap apron surface became exposed. The riprap apron halted the scouring process, and no edge failure occurred. The scour hole expanded toward the centerline of the bridge opening. Figure 74 illustrates a sloped full-width buried apron that was tested in run 9. The concept of the sloped configuration was to facilitate a transition from the channel to the channel bank upstream and downstream of the contraction. Photographs of the run 9 before and after scour are shown in figure 75. Figure 74. Sketch. Run 9 cross section buried full-width sloped. Figure 75. Photos. Comparison of run 9 as-built riprap installation (left) and at equilibrium scour (right). During run 9, local scour formed at the upstream corner of the abutment toe. The erosion process occurred rapidly until the riprap apron surface became exposed and halted further erosion. No edge failure was observed. The scour hole expanded toward the centerline of the bridge opening. Figure 76 illustrates a full-width buried apron for an opening on a 30-degree skew that was tested in run 11. The apron configuration and opening width was the same as that used for run 8. Photographs of run 11 before and after scour are shown in figure 77. Figure 76. Sketch. Run 11 plan view buried full-width 30-degree skew. Figure 77. Photos. Comparison of run 11 as-built riprap installation (left) and at equilibrium scour (right). As with the other runs in this set, local scour formed at the upstream corner of the abutment toe. This erosion process occurred rapidly until the riprap apron surface became exposed and halted further scour. No edge failure occurred. The scour hole expanded toward the centerline of the bridge opening. The physical experiments were designed to validate the hypothesis of increased shear stress with riprap aprons and to provide observations regarding riprap apron failure modes. The physical experiments also provided a basis for designing the numerical modeling experiments conducted using CFD. The CFD experiments are discussed in chapter 5. Regardless of the type of riprap installation, the riprap aprons in runs 1–5 experienced an edge failure as contraction scour occurred in the area of the contracted section not protected by riprap. For each of these cases, the maximum scour with the riprap, ycR, exceeded the estimated average contraction scour without riprap, yc (see table 1). However, the former value was a maximum value and the latter was intended to be a cross-section average; therefore, they were not directly comparable. In addition, there was no run with these abutment and hydraulic characteristics without riprap to use as a benchmark. Run 6 tested the same hydraulic characteristics as runs 1–5 but employed a buried full-width riprap protection layer. Abutment and contraction scour in this case went down to the riprap layer but was stopped by the riprap. If the riprap was adequately sized and properly installed, these results indicate the effectiveness of the full-width protection strategy in both arresting the abutment scour and the added contraction scour resulting from the presence of the riprap. Overall, these experiments showed that for the contractions tested, partial-width aprons placed flush with the original streambed surface were prone to failure because of contraction scour in the gap between the aprons. The experiments further demonstrated that, if properly designed, full-width riprap aprons buried so that the top of the apron was located at the estimated contraction scour depth could be effective at protecting against both abutment and contraction scour.